I have over 40 years handling dogs. Many years experience and education with animal behavior, animal technology, training, grooming, and boarding. I pride myself in having quality Brittanys that are home companions, field dogs, hunting dogs, performance dogs, and kids' friends. My dogs are raised in a home environment, well socialized with people and other dogs. All my young dogs are house trained, crate trained, and introduced to various every day things such as crunching tin cans, flapping canvas, dropped objects, etc. All my Brittanys are of sound temperament, sound structure, and completely health screened. My Brittanys have proven themselves in the show ring in numerous venues. 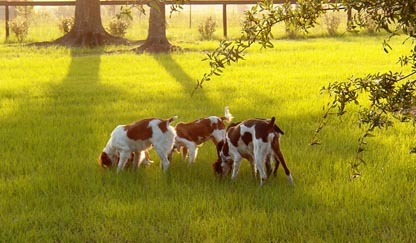 We are located in the beautiful horse country of Marion County Florida. We are on six scenic, landscaped, treed, securely fenced acres with that down home feeling and atmosphere. We are extremely clean inside and out. The Britts are well cared for, extremely happy, conditioned, and healthy. I am also extremely involved with Brittany rescue. I feel that every breeder should take care of rescue dogs in their breed.